VISITORS OR CONQUERORS: The Spooky Men's Chorale are a group of male singers from the Blue Mountains of New South Wales and Western Australia. THEY are hairy, manly and burly; male choirs Dustyesky and The Spooky Mens Chorale are prearing a battle and they are heading to a sing-off that will make moustaches curl, walls tremble and pantyhose lines tweak. The Spookys, as the Spooky Mens Chorale are also known, are as thunderous as a herd of wildebeest, as sly as a wagonload of Spike Milligans and as sonorous as a cloister of monks. 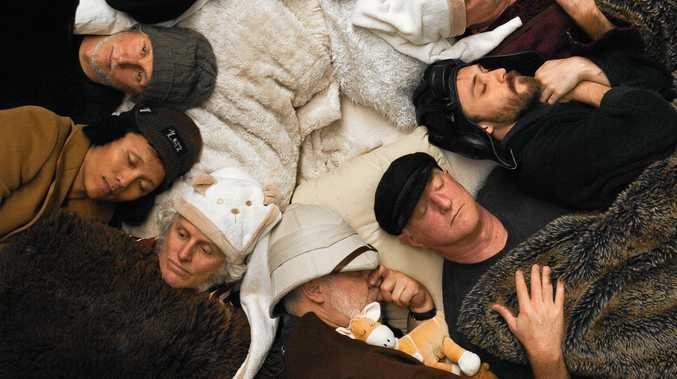 They emerged blithering and blinking-eyed from the Blue Mountains of NSW seventeen years ago and armed with no more than their voices, a nice line in deadpan and an ill-matched set of hats, have been gleefully disturbing audiences throughout Australia, NZ and the UK ever since. Their local counterpart, the pride of Mullumgrad, Dustyesky's sectre is lost in misty, undergrowth of our hinterland. Like the recipe for gherkin liqueur, the magic of their music lies in the heart of all of us but never one man alone. One of the choir's member, who could not be identified as he was unable to spell his name in an alphabet that is not cyrilic, invited the local community to this clash of music titans. "Come listen and believe. Your heart will soar. You will smile and cry. For sure. As rough as sawmiller's beard, as gentle as his touch, Dustyesky is elusive yet eternal. Like the wind of the Siberian steppes, we shall blow within you forever. Davai!!" he said. A full set from each choir and some battling hi-jinx will be performed to delight the new and the diehard fans. A never to be repeated event, until the next time. At Mullumbimby Civic Hall on Saturday, August 11, from 8pm. Tickets from redsquaremusic.com.au.